Originally, the cake was supposed to supposed to be served with apricots poached in Sauternes. Although I did poach the fruit, I decided not to photograph the cake accompanied by the apricots because the cake was too beautiful on its own to have something in the photo competing with it. 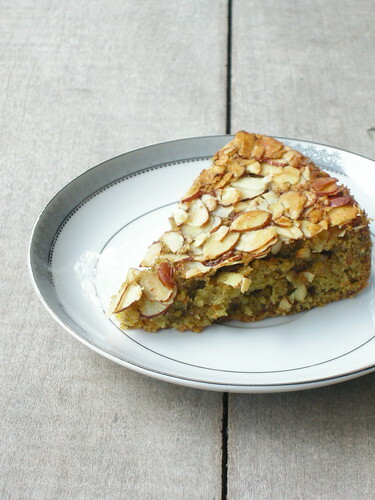 The flavor of this cake is quite intense because of the addition of freshly ground coriander. It reminds me, in the best way possible of course, of the three kings and the gifts that they brought along with them- gold, frankincense, and myrrh. It is a gorgeous cake, very regal. It is definitely an impressive dessert both in flavor and in appearances, so it would be a great thing to showcase the end of a carefully planned meal or as a holiday gift. Melt 2 tablespoons butter in a 9-by-2-inch cake pan. Remove from heat and cool briefly. Sprinkle the teaspoon of sugar evenly over butter and add sliced almonds. Set pan aside. Preheat oven to 350 degrees. In a food processor, pulverize pistachios with 1/4 cup of flour, as finely as possible. Cream butter and sugar. Add eggs, one at a time, beating to incorporate. Sift together 3/4 cup flour, baking powder, and salt. Beat into batter. Mix in pistachio-flour mixture and ground cardamom. 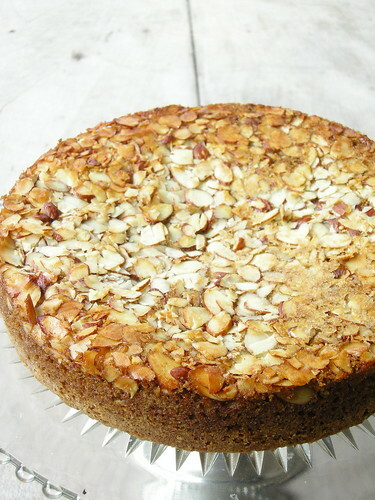 Transfer to prepared cake pan, spreading carefully over almonds. Bake for 40 minutes, or until a toothpick inserted in the center comes out clean. Let cool completely. Overturn onto a cake plate.